Amy was the Minister of Music at First Methodist in Searcy for 14 years until her family moved to Jonesboro in 2018. 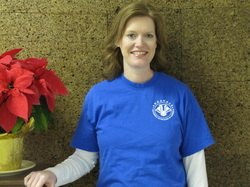 She has recently joined the staff of the First United Methodist Church there as assistant choir director. She holds a Bachelor of Music from Meredith College in Raleigh, NC and a Master of Church Music from Southern Baptist Theological Seminary in Louisville Kentucky. Prior to moving to Arkansas, she served in several churches in the Lexington and Louisville areas: Baptist, Presbyterian, and Disciples of Christ. She is trained in Early Childhood Music (Musikgarten primarily) and also obtained Orff Certification Levels 1 & 2 from the University of Kentucky.